It’s no secret that the Internet absolutely loves cats. They’re cute, they’re lazy and we just can’t get enough of them. But are you familiar with Tard the Grumpy Cat meme? Who Is Tard the Grumpy Cat? Tard the Grumpy Cat (short for "Tardar Sauce") is an Internet celebrity that has gained worldwide recognition for her hilarious facial features, which make her look like she is permanently frowning. The top parts of her eyes are slightly furrowed and her mouth naturally shaped in a strong downward facing curve. She definitely doesn't look like a very happy kitty, and ironically, that's exactly what makes her so lovable! Even though she looks so displeased, it’s hard not to find her completely adorable at the same time. It seems as if the world has never seen a cat with such a human-like facial expression. How did Tard the Grumpy Cat Get So Famous? If you want to know Tard’s story, I recommend checking out her official website at GrumpyCats.com, which was set up by her owners. According to the site, A photo of Tard was posted on Reddit in September of 2012. When something good hits Reddit, there’s no stopping it from getting a ton of views and a lot of upvotes from users who approve of it. Most people were convinced that the original photo of Tard was actually photoshopped to make her facial features look especially grumpy. Tard’s owners uploaded video footage of her to prove that she does indeed look naturally grumpy, and the videos went viral shortly after. GrumpyCats.com was set up so that the whole world could enjoy photos of Tard, and new photos or videos of her are uploaded there almost on a daily basis. Tard is actually very friendly and loves to be held and rubbed, according to the Q&A section on GrumpyCats.com. In most of the videos, she seems as playful as any other regular cat. As soon as Tard’s image was shared, Redditors got to work on meme creation. You can now find several variations of Tard’s grumpy image all over the web, featuring different captions in the iconic white Impact font. One of the most popular Grumpy Cat meme is the one that is captioned to say, “I had fun once. It was awful.” To check out more of them take a look on Know Your Meme or search for “grumpy cat” on Tumblr. 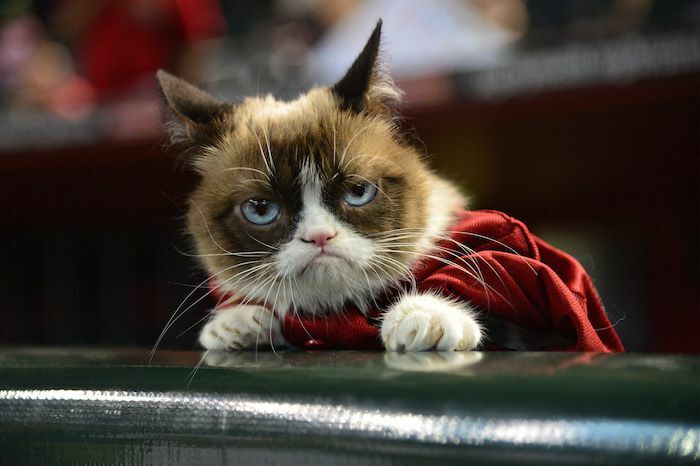 As of September 2015, Tard the Grumpy Cat has over 8 million likes on Facebook. Just months after she was introduced to the social web back in 2012, she launched her own line of T-shirts and was picked up for a story on NBC News. Tard is possibly the feline equivalent of Boo the Dog online. She’s quite the opposite character of the smiling dog, but a grumpy cat seems to have been exactly what the Internet needs.